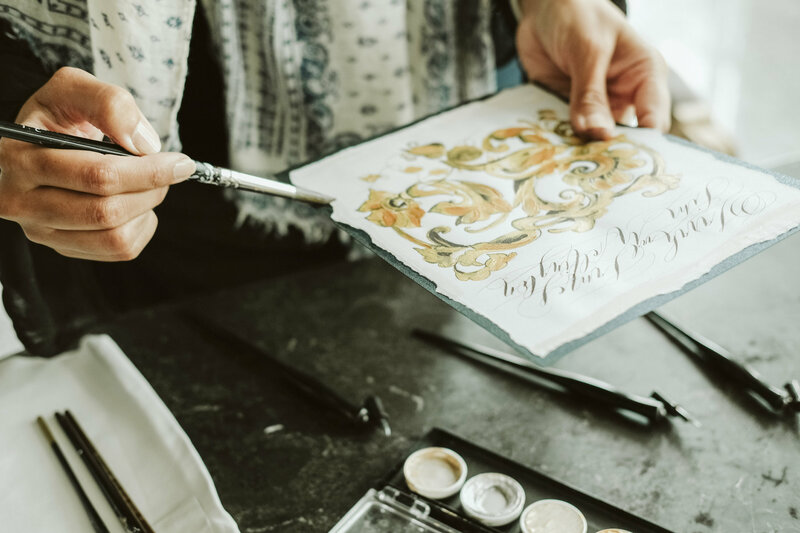 To start, what exactly are custom hand painted wedding invitations? To begin with by saying custom, that means that your invitations will be customised to you! Your chosen colours, your particular theme, whatever you desire, it will be yours. 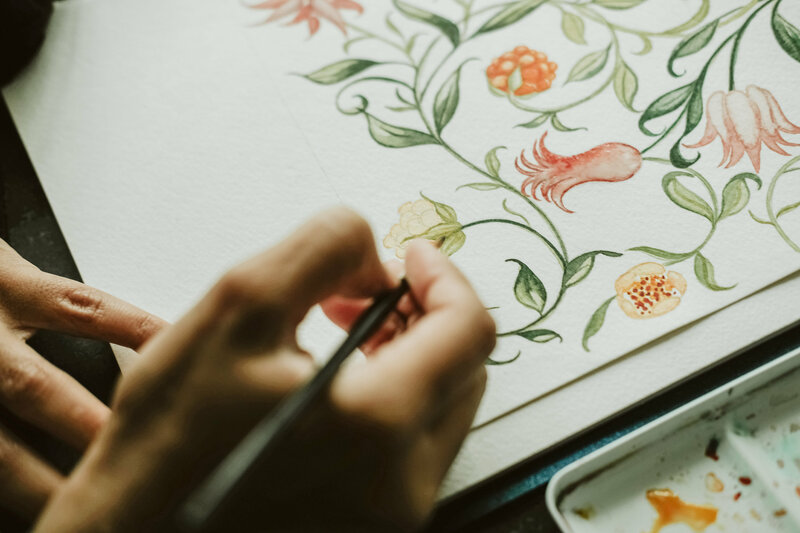 You work one to one directly will an invitation designer and go through several stages of artwork and design to arrive at exactly what you are envisioning. How about custom hand painted invitations? Is each and every invitation literally hand painted? Yes and no. Your artwork is all developed and hand painted. 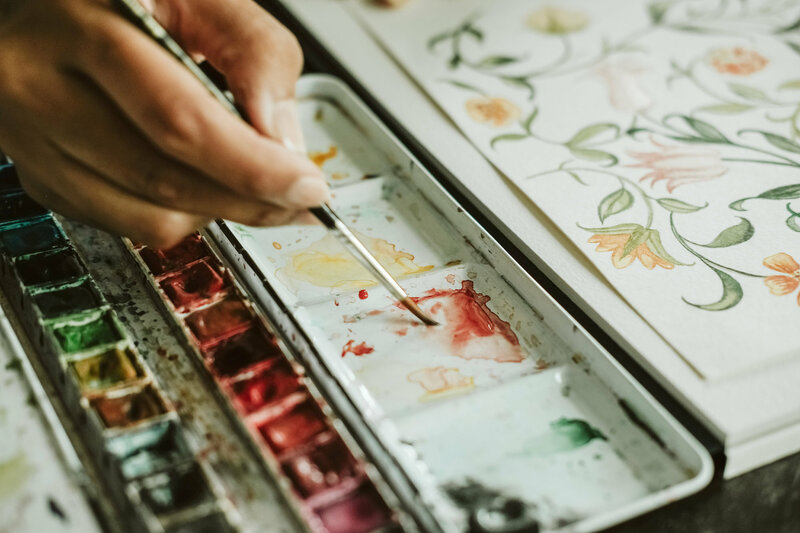 Then depending upon your budget, it can be printed or, yes, the final invitations and cards within your stationery suite can all literally be hand painted. I find that I often used a balance between the two for most of my invitation suites. Everyone wants their wedding to be special and unique. 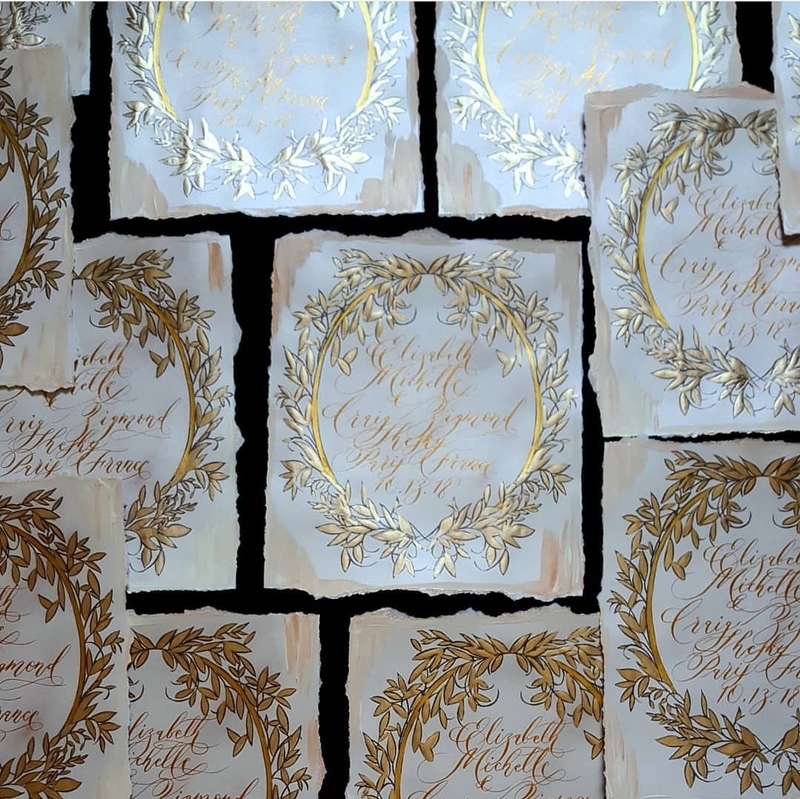 So why custom hand painted wedding invitations? Unfortunately, for your wedding to be unique, that’s easier said than done because today all weddings seem the same. The guests receive a generic wedding invitation card, they visit a venue with pastel coloured decor, and listen to the wedding themed songs that are present at almost all weddings these days. If you really want your wedding to be unique and interesting, you need to think outside the box, and plan a wedding that’s a good reflection of you as a couple. Many couples are choosing to design highly personalised weddings, going to smaller intimate weddings. In addition, many couples are now opting for destination weddings and want a higher level of service with completely custom handmade wedding invitations. Custom hand painted wedding invitations can be used with bespoke watercolour designs, artwork or any illustration effect you desire. 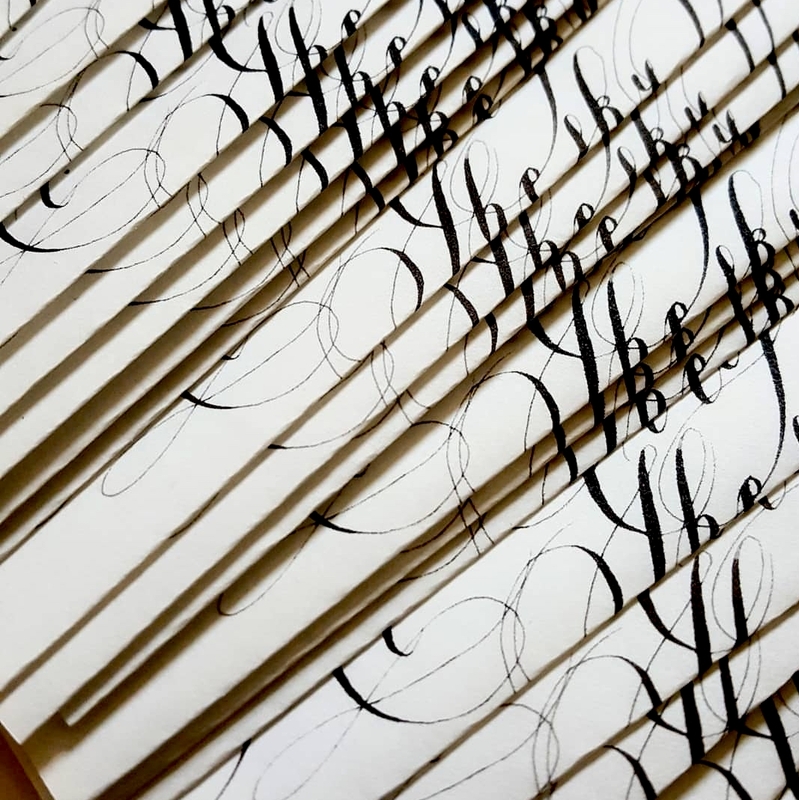 Many of my clients also want custom designed calligraphy to further compliment their enticingly designed invitation suite. The beauty of hand painted invitations is that no two designs are the same. As a couple, you are both unique, you have particular personalities and certain stand-out moments that brought you together. You both have passions and interest that set you apart. You want to weave those passion throughout your wedding and your wedding invitations. I would love to listen to your story. What is your favourite type of architecture? What sorts of interiors do you love? What are your favourite flowers? Which country you love travelling to and do you perhaps want a wedding in France? What is special about your culture or heritage? Or perhaps you would like your invitations and stationery to reflect your wedding venue? When I design your wedding invitations they will be to completely unique to you. As a London Wedding Invitations designer I will pour all of my heart into your illustrations and design them with your personality and relationship in mind. As an artist I always put in a lot of time, thought, and effort into getting to know you as a couple, so that I can create the designs to ensure they represent you well. My hand painted wedding invitations will immediately draw attention and leave a great impression on your prospective guests. Here’s a brief glimpse at some invitations recently created for a wedding in the Ritz Carlton, Paris ( BELOW). What’s Special About My Custom Hand Painted Wedding Invitations? Paper – I only use high quality and textured paper that looks and feels luxurious and weighty. These papers are sourced from GFSmith, London. Mostly, I tend to use whites, neutral and dark colours for accents as well as particular coloured papers to weave in your chosen colour theme. I often like to create watercolour washes onto each of the papers I use, to give them a completely unique look. Papers are often used with heavier card stock to mount all my hand painted wedding invitations on. People who receive your invitation would immediately understand the value and effort involved. The paper and raw materials I use serve to enhance the overall look of the invitation. Envelopes -I pride myself on making in-house luxury hand painted envelopes that are often oversized. I often have many questions over social media, “Are they really hand painted?” Yes, indeed they really are hand painted! This adds an extra wow factor to your paper suite. You can run your fingers over the texture and know that you are holding a piece of art in your hands (below). Adornments - Upon request, I can source silk ribbons and chiffon to add as an adornment to your stationery. 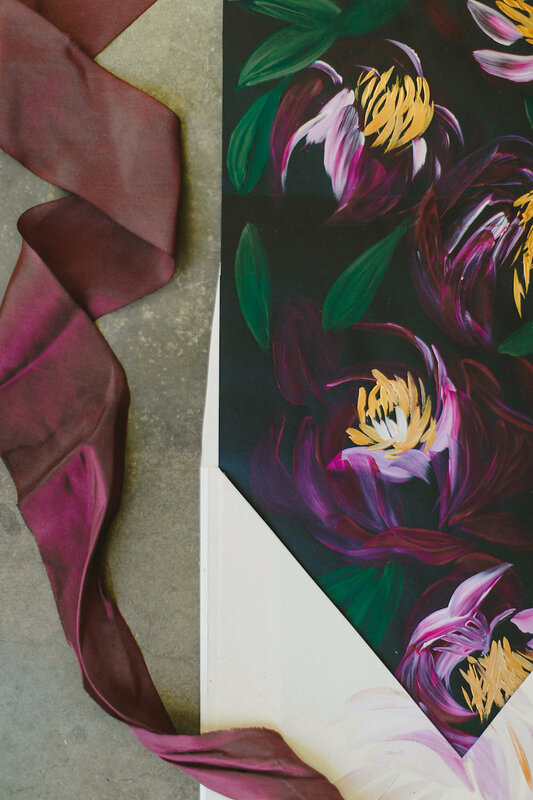 I make as effort to only use and source the absolute best in the industry, buying all of our hand made silk ribbons directly from Silk and Willow, New York. Excellent Design – I have a degree in Art from the university of Nottingham Trent and I have an excellent understanding of illustration and can create wedding invitation cards that look elegant without being cheesy or far from the norm. My hand painted wedding invitations and cards are often quite dramatic as well as being subtle with gentle botanical designs if needed too, so to add a personal touch to the invitation. It is important that you select a designer that has a portfolio that you immediately identify with. The right artist can make it very meaningful. Don't just approach any invitation designer or artist. If you approach a designer that specialises in light and airy creations such as Jenny Sanders, you cannot expect her to design something as rich as Crimson Letter's designs. Make sure you chose a designer that has the right, look, feel and designers you are instantly attracted to. That way you will have a very good working synergy. From Inspiration to Design- I will use your inspirations and themes to create the bespoke, custom designed illustrations for your wedding. See this bespoke watercolour wedding invitation suite I recently designed for a client, featuring florals. 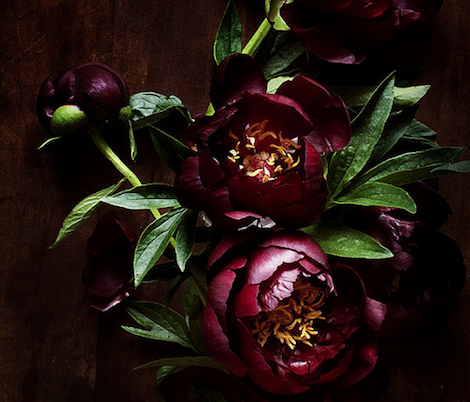 Take a look below at an example of how the I used the below dark coloured flowers (Image credit here ) for the main inspiration point. Using that as a focal point, I started to create a large gestural, abstract acrylic painting that became the central focus point of the entire wedding suite, as a hand painted envelope liner for a bespoke order. 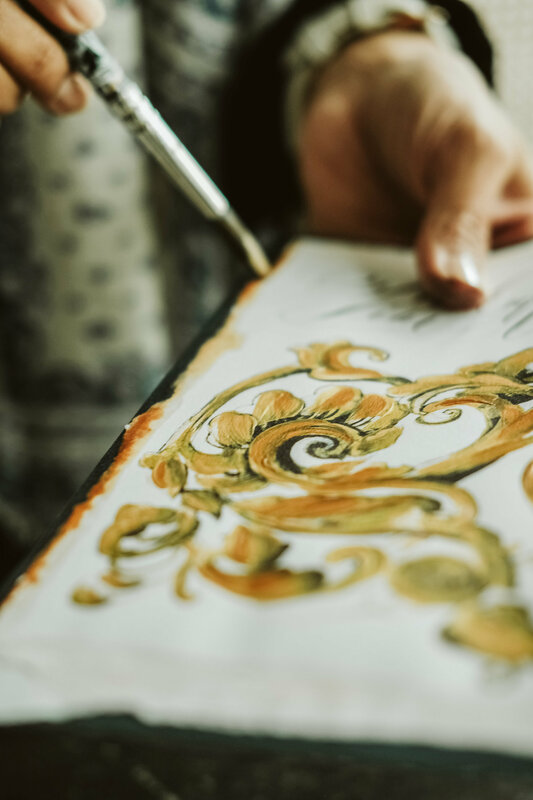 Any points of inspiration and visual ideas can be used to shape a design for your custom hand painted wedding Invitations. Combination of Different Techniques – As an artist I use a combination of different tools and techniques to create a great design for your custom hand painted wedding invitations. 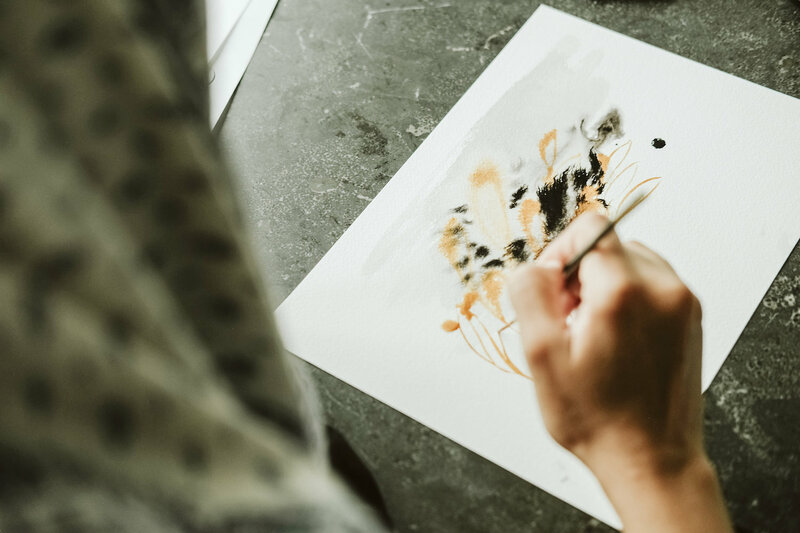 Combining drawings, sketches, ink work, acrylic paint in gestural backgrounds, as well as watercolour washes to create a stunning and elegant design. The contrast of sharp and vivid lines of acrylic paint with the faint, wispy water colours creates a stunning effect and adds dimension to the design. 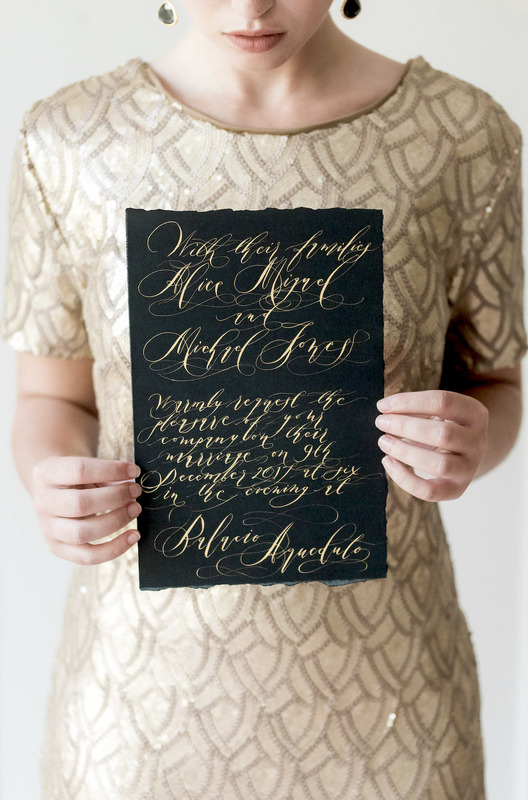 Words written with calligraphy just add another dimension to the invitation. 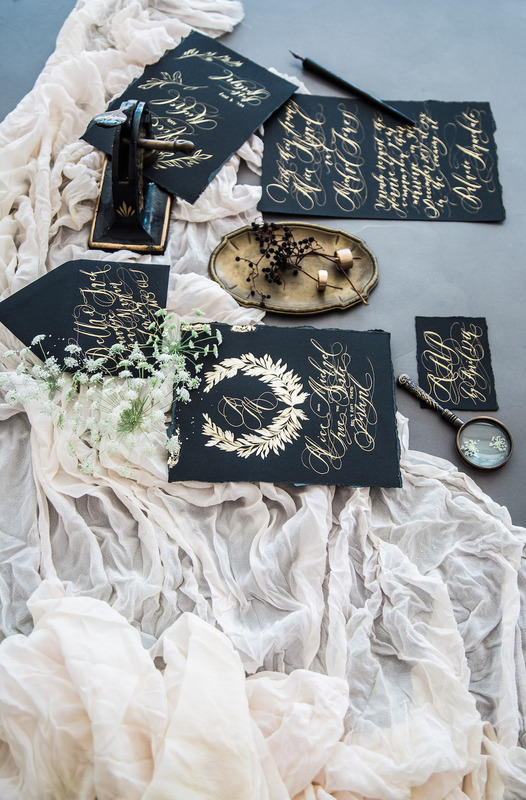 How do you work with a Custom Hand Painted Invitations Designer? When you contact me, it is important that you have some idea of what you are looking for. Here are some first steps that will help you in the right direction. Choose from my Portfolio. Take a look through my Portfolio here. This makes the entire process considerably easier and helps us to start out in the right direction straight away. Which Portfolio collections to you most prefer? Even if there are two or three separate collections, they can be combined and used as inspiration moving forward to shape your design. Looking for a completely custom design? What do I mean by a completely custom hand painted invitations? You are looking for a design that is not in existence yet. You would like a striking design made specifically to reflect your personalities and your passions as a couple. Perhaps you're having a wedding in a palace and would like details from the interior to be used throughout your design. 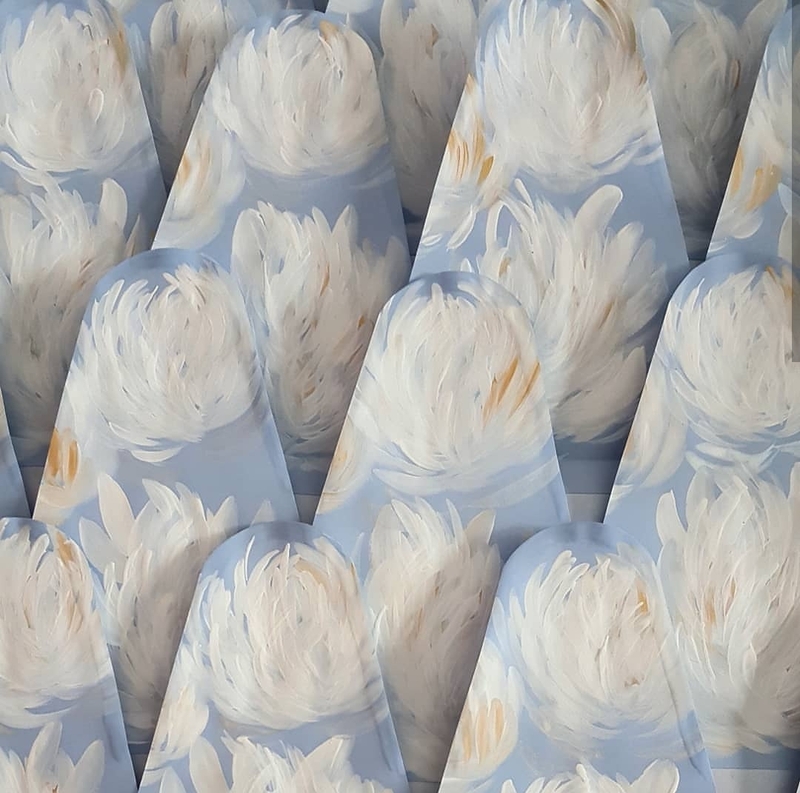 Or perhaps there are particular flowers in bloom around the wedding venue that you would like as a watercolour painting and used throughout your handmade invitations and other wedding collateral. The cost of a completely custom design is considerably higher and starts at £2599, this is due to the large amount of time, effort, dedication, detailed work and level of skill needed to create artwork. It takes about 2 - 4 weeks to come up with designs and work with you to create your final vision. 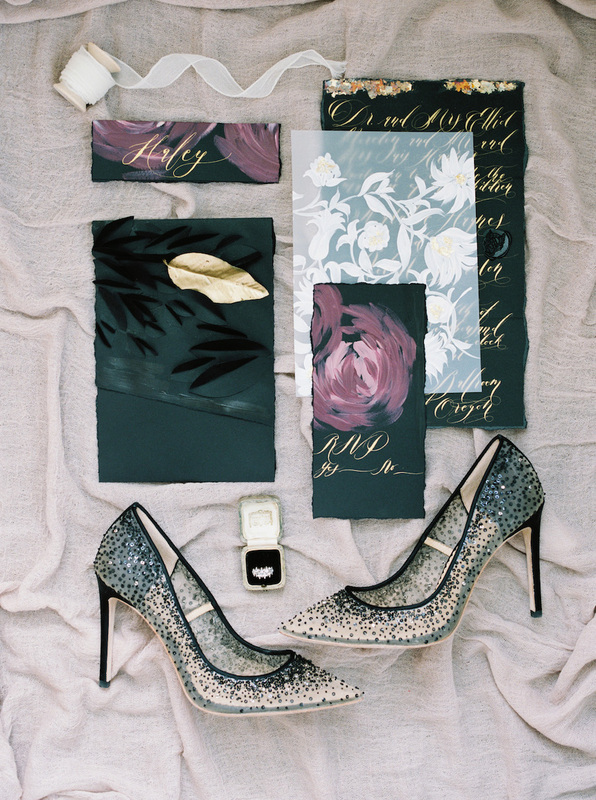 Inspiration for custom hand painted invitations is critical. As a designer, I am highly visual. I need visual inspiration to start working on your designs / project. It is no good to come to me and say, I am looking for something romantic. Romantic can mean so many things! I work very well from any images that you can provide. Perhaps you could provide a tile design that you have seen in Italy that you would like to use as an influence? What are your favourite flowers, which flowers will you be using throughout your wedding decor / bouquet? What types of interiors do you love, can you give some examples? Which colours will you be using throughout your wedding? Are there any colours that are essential for your to use. Do you have some other examples of wedding stationery that you love? Giving me 10 examples of other designs will not help, try to make a small selection and remember that I can only use this as an influence and cannot copy other designers work. 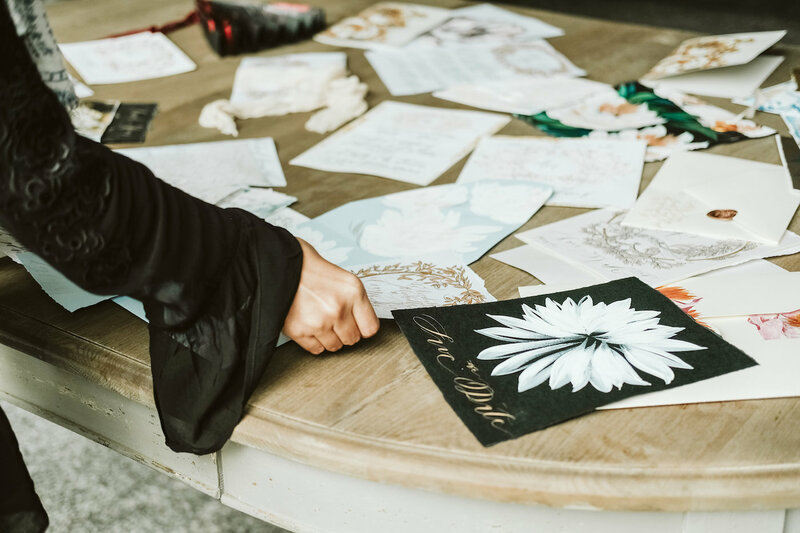 If you are thinking of hiring me to create your as custom handmade wedding invitations, then take a look at my pricing page. Want to know more? Just get in touch with us at Crimson Letters today and we’ll be happy to explain our custom hand painted invitations services to you. Just contact us through this form and we’ll reply as soon as we can.